Have you ever had a meal that stayed with you? And stayed and stayed and stayed? I had one of those, and I want to share the experience as best I can. To do this, close your eyes and travel with me to The 1829 House, a wonderful old inn — it’s as old as its name, and was once a haunt of the dread pirate Blackbeard — dug into a hillside above Charlotte Amalie and the harbor of St. Thomas, in the U.S. Virgin Islands. It is there, on my honeymoon, that I first experienced a fresh fruit salsa, and I remember it to this day. The sun was sinking over the hills to the west and the sky was ablaze with reds and oranges and purples unlike any I’ve seen anywhere else. It being my honeymoon, I was, of course, dazzled by the company, the setting, the steel-drum music plunking gently in the background, and the bittersweet knowledge that it was our last night on the island, a last romantic dinner before heading back to Pennsylvania and reality. Every meal should have some zing, and it turns out, a fruity, tangy salsa is a perfect complement to grilled pork or chicken. It is a flavor marriage that, while not everyone’s idea of what a summer barbecue ought to look like, stands out in my mind as perhaps the best restaurant meal I’ve ever eaten. Served with a lightly dressed mesclun salad and a tall, cold, locally featured rum drink, this meal actually distracted me from my honeymoon for perhaps a moment or two. This is one that deserves to be served to company. I have strived mightily to reproduce that special salsa, and the result is a worthy challenger. Not being the biggest fan of mangoes, I opt to leave them out of my recipe, but you don’t have to. They will make the salsa sweeter, and will add a tropical flavor and texture. And while I believe that this salsa is best served with grilled pork or chicken, one of my best friends and wisest critics — one who chooses to remain meat free — suggests that you eat the salsa with chips. 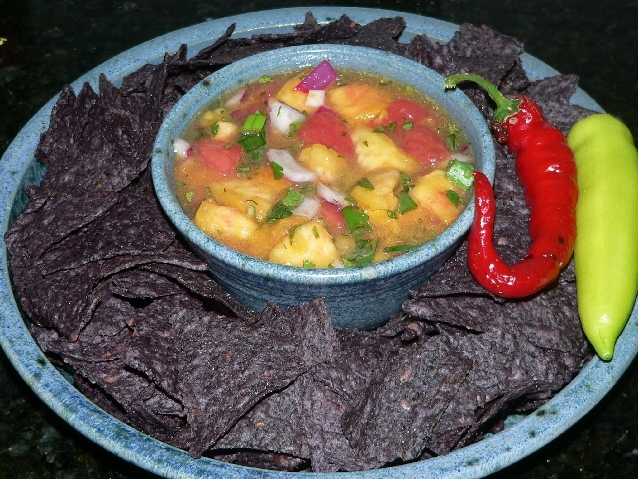 Try the dish with some blue corn or plantain chips. Fortunately for all of us, the locally grown peaches are right here, right now. Go get some and try this recipe. Dip the peaches into boiling water for 30 seconds, plunge into ice water, and let them cool. Then peel the skins. Cut the peaches in half, discard the pits, then cut the halves into thin slices. Toss with lime juice. Using the same boiling and ice water, repeat the skinning process with the tomatoes. Seed them, quarter them, and then cut the quarters into slices. Combine the peaches and tomatoes; add the onions, peppers, cilantro and ginger. Mix well. Whisk together the oil and vinegar. Pour over the other ingredients and toss gently. Allow the mixture to marry about 1 hour. If serving within several hours, no need to refrigerate. Otherwise, cover with plastic wrap and chill until serving. Email Jeff Thal at talking.fresh@yahoo.com or visit his blog, talkingfresh.typepad.com/blog.